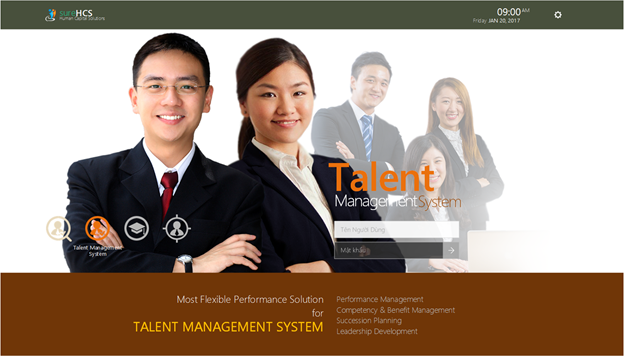 SureHCS for Talent Management is a tool that helps enterprises communicate effectively with each other about organizational competency, employee eligibility, performance and capacity management to build a company with a strategy of developing talents to each employee, creating high efficiency in the long term in the development of sustainable human resources and increasing the competitive advantage for the enterprise. Alert, remind the time limit to assign targets to the levels and Human Resources, ensuring the timely performance evaluation, ensuring the timely implementation of employee welfare after evaluation. 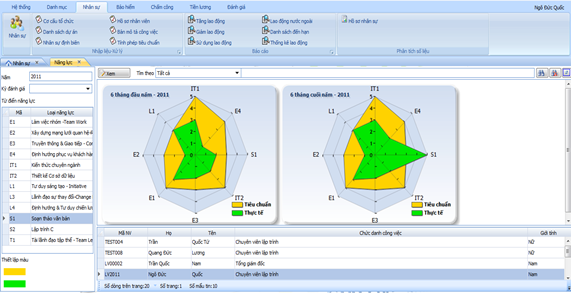 Automatically check the consistency of the indicators from department to employees, minimize calculation time and prevent errors. Automatically recommend bonus policies after the evaluation for each employee. Enumerate and analyze the performance of continuous productivity, create multi-dimensional analysis, help Board of Directors to monitor and adjust employee management strategy in time depending on the actual productivity. SureHCS Capacity Building and Assessment module assists enterprises in setting up core competency frameworks, managing employee profiles, and developing training requirements for comprehensive capacity development, which is appropriate to the career path as well as meets the capacity requirements. Support to develop a job description and build a capacity framework for each job title. Establish the Portfolio of Professional Certificates, set the required standards for each title. Manage employee profiles, qualifications list, certificate types. Establish the evaluation cycle depending on the periodic/unscheduled evaluation requirements or the succession planning. Propose and approve Personal Development Training Plan (IDP) as required. Recommend welfare policy: Salary - Bonus – Succession Planning after evaluation. Report available capacity statistics, the level of response to the standards of competency based on the current title or the succession planning. Plan the effectiveness of the successor resources, assess the risks of internal resources change, and then implement the right strategies in a timely manner. Support the development of an annual employee satisfaction survey, combined with the results of the performance and capacity evaluation, to help the enterprise develop a comprehensive HR strategy consistent with the level of resource development and strategic business planning of the enterprise.